Monday morning sunrise. What’s for breakfast?! 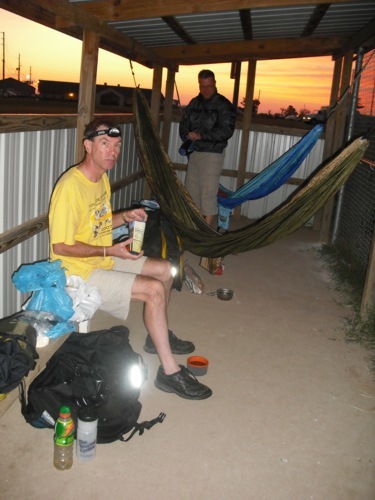 The sunrise woke us up Monday morning and we cooked up our oatmeal sitting in the dugout. As we packed up our gear a man drove up to the other side of the ballfield and began mowing the grass. He most certainly saw us but never said anything so we continued packing and headed for the trail. 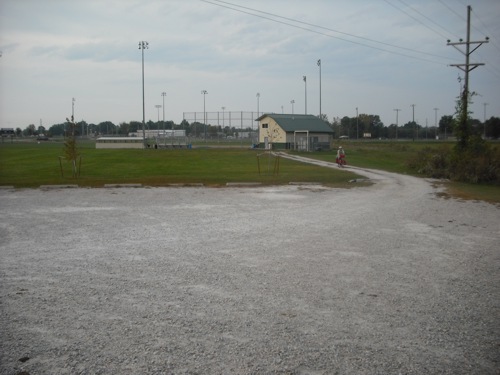 Here’s the ballfield where we camped. The dugout is the little rectangular building to the left. 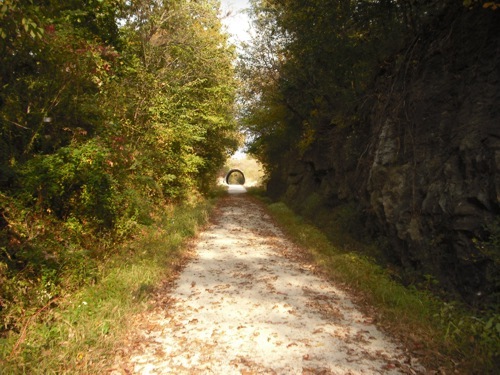 The Clinton Trail Head, the western end of the Katy Trail. The trail ends 225 miles to the northeast of here. Let’s get going! 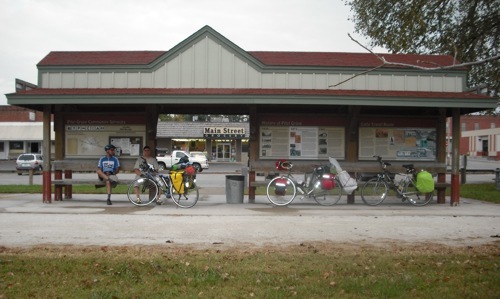 The problem we faced today was that if we wanted to camp at Katy Roundhouse Campground in New Franklin as originally planned, we would need to make up the distance we lost by not cycling to Windsor the day before. That made for a long 75 mile day. In retrospect, we should have changed our itinerary but our plan was to go the complete distance. Off we went. Craig’s legs were sore from the day before but not cramping this morning. Otherwise we all felt good and ready to tackle the day. It was nice to be offroad on the trail away from any cars. looked like we were cycling through a green tunnel. 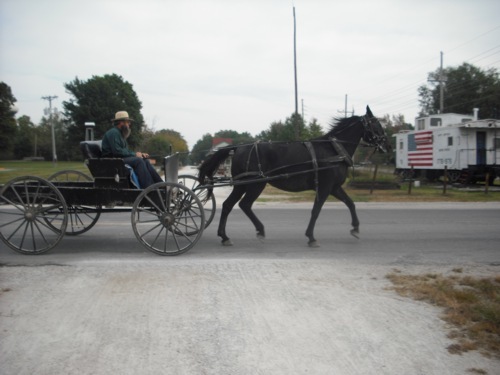 There is a large Amish community in Windsor. Notice the white caboose to the right with the American flag. When that caboose was donated to the city of Windsor it had been painted green. Some city folks decided to clean it up one year and discovered the flag painted underneath the green paint. Turns out this was a one-of-a-kind MKT caboose that had been painted with the stars and stripes in honor of the Bicentennial. What a cool discovery. This was marked as the high point of the trail, 955 feet elevation. The trail up to this point has been a gradual uphill climb. We thought it should be all downhill from here. How wrong we were! Looked like rain so we stopped at the Green Ridge Trail Head to put on rain covers. Monday was turning out to be much less of a struggle than Sunday’s ride had been. 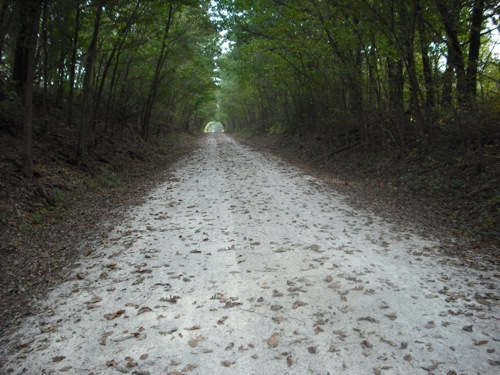 Other than the gradual inclines (the western end of the Katy Trail does have some gradual hills while the eastern end is flat) and two light rainshowers, our morning and afternoon were a blissfully uneventful and enjoyable ride. Back on the trail after a great Mexican lunch at El Espolon in Sedalia, it was difficult to fathom that it was already afternoon and we still had over 45 miles to go. So on we pedaled. I love these old steel train bridges. Stopping to stretch our aching muscles. Taking a break at the Pilot Grove Trail Head. I ran into the grocery store and bought some bananas and OJ. Would have been nice to have those bananas the day before to help Craig’s leg cramps go away. The sun began to set as we rode through Boonville. 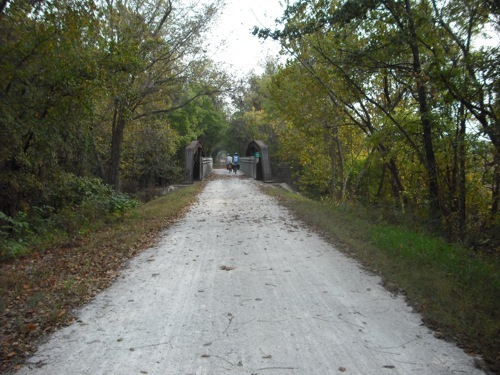 The Katy Trail deviates from the original rail trail in Boonville and detours through the city streets, past the new casino and over the new bridge crossing the Missouri River. 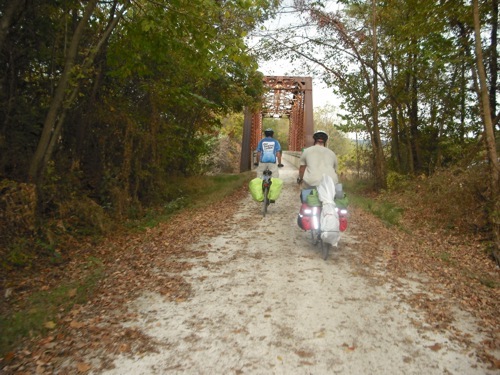 There is a continuing controversy over the future of the old Boonville Bridge that crosses the river at the rail trail. The old bridge was built in 1931 and features a unique electric lift which raises the entire center span to allow barge traffic to pass underneath. The Department of Natural Resources would like to tear down the old bridge because they argue that it is dangerous to river traffic. 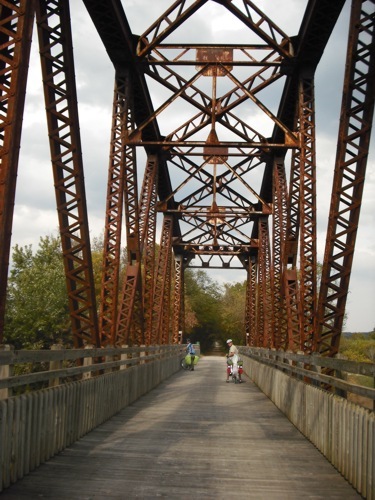 Many people (including me) would like this historic bridge to be spared and renovated for use on the trail. If you are interested in learning more about this battle, check out this website: www.SaveTheKatyBridge.org. Crossing the new Missouri River bridge in Boonville at night was a bit dicey. The headlights from the oncoming cars completely blinded us. Thank God for the protective cement wall which separated the bike lane from the road. But the lane is only wide enough for one bike. 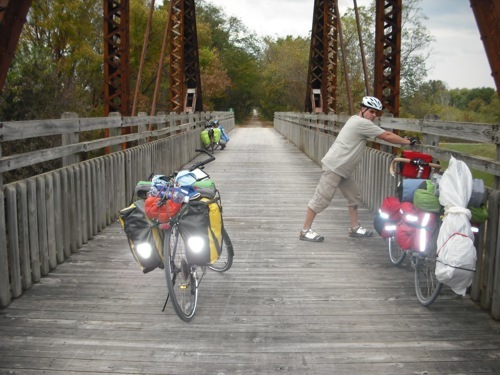 There is no lane for bikes going the other direction… I don’t know what would happen if two loaded bikes needed to cross paths on that bridge. Fortunately we met no other riders at 8:00 p.m. Monday night. 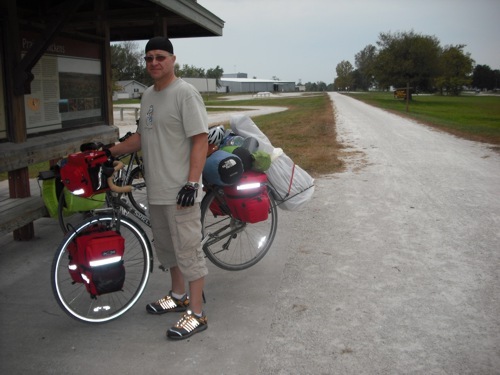 We arrived in New Franklin in the darkness and kept our eyes open for the Katy Roundhouse Campground where we would be staying for the night. 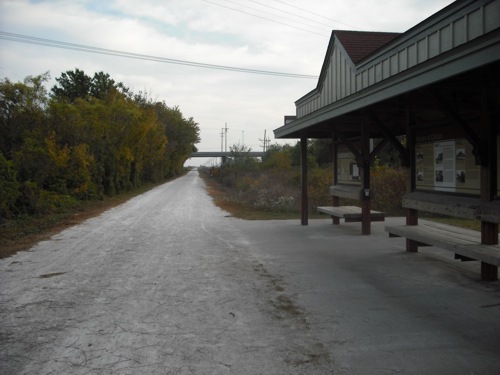 The BikeKatyTrail.com website said that the Katy Roundhouse was at mile marker 188. We passed mile marker 188 but there was no sign of a campground so we decided to keep going a little further. We passed mile 187. And then 186 (the mile markers begin at the eastern end of the trail)… but no campground. And the area was becoming more and more remote. 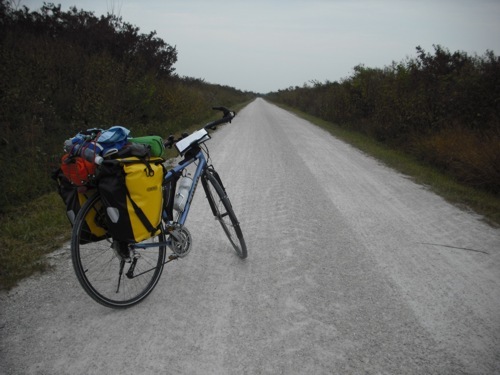 We’d already pedaled 78 miles that day and we were sore, tired and feeling a bit desperate. Bicycling on the trail after dark is not fun. It is pitch black out there and even with both my headlamp and bicycle headlight, I couldn’t see very far in front of me. 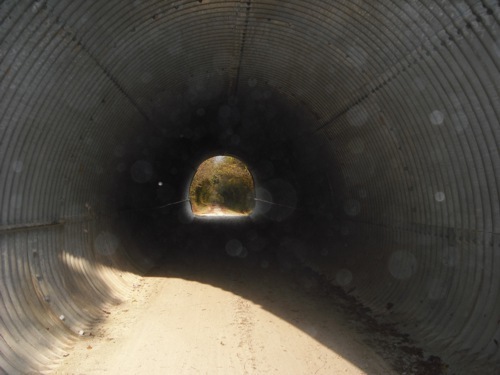 A blurry black shape crossed the trail in front of me and when I turned my head to where it disappeared into the brush, two racoon eyes glowed back at me in the light of my headlamp. Pretty spooky. There were frogs absolutely everywhere. I confess, that night I became a frog mass murderer. Try as I could to miss them, those little amphibimaniacs kept leaping in front of my tires. I felt so guilty and mean. But the worst of it was that this part of the trail is very sandy. We couldn’t see the sand in the darkness to avoid it. Our heavy bikes skidded all over the place when they sank into the sand. 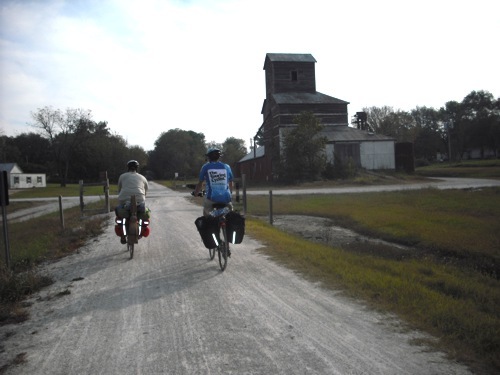 Right as we passed mile marker 186, Gerry asked if anyone had the phone number for Katy Roundhouse. Well DOH! I sure did but I hadn’t even thought of that. I didn’t think there would be any cellphone reception in such a remote area. Amazingly, our phones worked and we got an answer at Katy Roundhouse. They are at mile marker 189 not 188. We hadn’t even been looking for them way back then. There is no sign visible from the trail and especially not in the dark. So… GROAN… we turned our heavy loads around and pedaled three miles back through the sand traps and over all the suicidal frogs. Everything was damp and the mosquitos were huge and ferocious as we set up camp in the darkness. Craig and I were too tired to even cook dinner so we just ate a couple of Clif bars. I did take a shower at the shower house… AAAAAHHHHH! Hot shower!!! As I stepped out of the shower house to return to the campsite a bunch of wild dogs started yipping and yowling nearby. I hesitated because they sounded very close… so close that when I shone my headlamp in their direction they stopped yowling. A man leaned out of his camper and said not to worry, they were just puppies. “Oh, okay.” I’m not worried about the puppies, I thought, I just don’t want to meet up with mama coyote along this dark trail back to our campsite. But mama coyote had mercy on me and I made it back to camp safely. Does it sound like maybe we haven’t been having such a fun time? As miserable as it was, we were still happy to be on this adventure at last and now finally at our campsite!